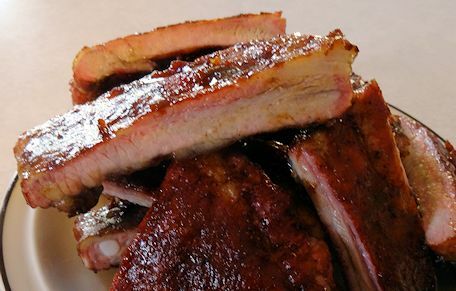 The best test for a smoker is spareribs in my opinion. Can it get them done just right with bite off the bone texture as opposed to fall from the bone? Is there a good smoke taste that isn’t too strong? Well, I have my new Louisiana Grills Pellet Smoker and I decided to give ribs a try. The timing was perfect because they had side ribs on sale at the local supermarket and I didn’t have to sell my blood to be able to afford some. I went with my basic cooking method, commercial rub and barbecue sauce. That way, I would be able to get a fair measure of the smoker without worrying if trying something different would get in the way. I pulled the silverskin off the back of the ribs. Then I rubbed them down with Cabelas Kansas City Rub. I put the ribs on the smoker which I had preheated to 220 F. Inserted the probe from my Blue Therm Duo into the thickest part of the ribs being careful not to let it touch a bone. It took about 4 1/2 hours for the internal temperature of the ribs get to 185 F. Then I brushed the ribs with barbecue sauce and let them cook for 30 minutes longer. 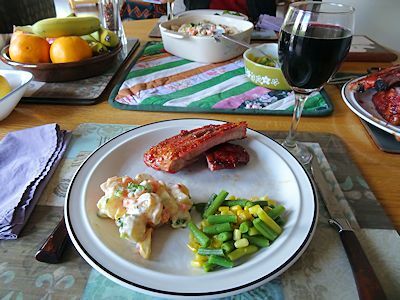 I cut the ribs into sections and served them with She Who Must Be Obeyed’s potato salad and mixed corn and green beans from our garden. The Louisiana Grills smoker did a great job. It held the temperature steady for the long cook at low temperatures. The ribs had a nice smoke taste without overpowering the sweet flavour of the pork. The texture was perfect. If you bit into a rib, the pork pulled from the bone without the whole piece of pork falling off. I love my new smoker!